Police Scotland say they have held "constructive" talks with Celtic after fans were caught up in a crush outside the club's stadium at the weekend. One person was taken to hospital and four more were injured before Sunday's match against Rangers. Celtic has apologised to supporters involved in the incident. After a meeting on Tuesday, Ch Supt Brian McInulty said there was no evidence to suggest a gate was closed in the lead up to the match. He said police would meet with fans' groups to discuss their concerns. Celtic said on Monday that the game was the first occasion which featured new segregation and access arrangements for the Old Firm fixture. Image caption One fan described the situation as a "joke"
Police Scotland had promised a "thorough and comprehensive" debrief of the policing and stewarding operation. Following a meeting with Celtic, Ch Supt McInulty said: "There were a number of points discussed and actions which will be taken forward. "Later this week I will meet with representatives from Celtic FC supporters clubs regarding any concerns they may have. "I am aware of a lot of conflicting information being circulated regarding what took place on Sunday. "I can confirm that having carried out a comprehensive multi-agency debrief today, we have found no evidence to support suggestions that the gate on Janefield Street was closed at any time in the lead up to kick off." The incident happened about 20 minutes before the 12:00 kick-off as Celtic supporters tried to make their way into the stadium. Police had earlier cordoned off a section of London Road to allow Rangers' 800 fans access, forcing more home supporters than usual to use the Janefield Street entry point. 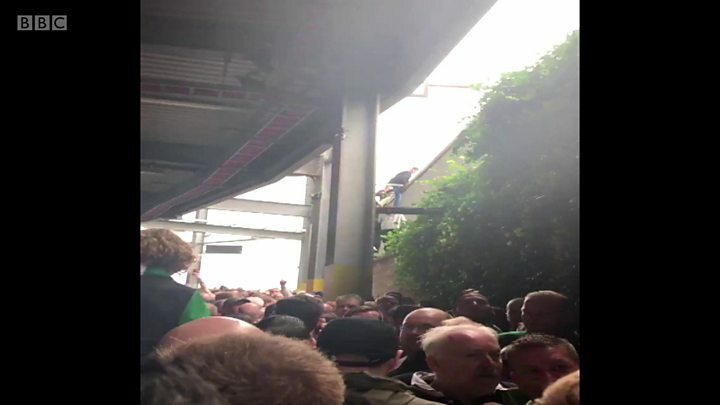 Hundreds of people were then caught in a two-way crush in the corridor under the stadium's North Stand. Celtic fan Jamie Kerr, who was in the middle of the crush, told BBC Scotland: "It was actually very, very frightening. The good nature of the tunnel very quickly turned into one of worry, one of panic. There were kids crying." Celtic supporter groups called for a thorough investigation. The Celtic Trust called for fan groups to be involved in any debrief with the club and police. Ch Supt McInulty said lessons would be learned from Sunday's incident and said the safety of people attending football matches remained "the absolute priority for Police Scotland". He added: "In realising that the area was becoming overcrowded, officers and stewards acted quickly to stop further people entering Janefield Street, which was in line with our tried and tested plans for this type of situation. "Had it not been for their actions there could have been a far more serious outcome and I am grateful to them for the professional manner in which they responded." In a statement on Monday, Celtic said: "Our total focus now is to work with the police in looking at these arrangements and other circumstances surrounding this particular fixture and to take the correct action to ensure this situation is never repeated. "Our priority will always be to ensure our supporters enjoy a safe and positive experience at Celtic Park."